Eagle Superabrasives is a premier supplier of superabrasive supplies in the United States. We manufacture glass grinding wheels that will bring a cool, clean and precise finish to the workpiece. Our extensive inventory of over 6,000 diamond, cbn and cdx wheels offer a large selection when choosing the best glass grinding disk for your business needs. A grinding wheel is an essential tool when working with glass. 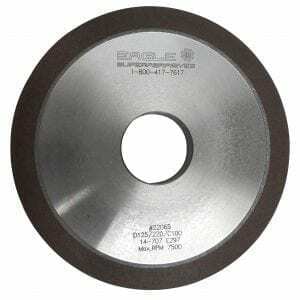 A grinding wheel or grinding disk performs the same function as the teeth in a saw. However, instead of only having teeth on the edge, a grinding wheel has abrasive grains throughout the entire wheel. With thousands of superabrasive grains distributed throughout the entire wheel, the wheel grinds the glass away with a much smoother and precise cut. With a long wheel life and effective grinding properties, the wheels are used grind and shape glass. In order to grind glass effectively, metal bond wheels are typically the superior choice, due to their extremely abrasion resistant makeup. The abrasive grinding fines that are produced from the discs while cutting through glass can cause the wheel to prematurely erode many resin bond systems, resulting in less than optimal wheel life. Most of our glass grinding wheels feature a metal bond to obtain optimal wheel life, however to extend the life of your wheel, while grinding glass, we recommend wet grinding. Wet grinding with glass is recommended because the particles that breakaway from the glass will be kept away from the wheel when wet. When you’re ready to try the best for glass grinding, trust the experts at Eagle Superabrasives. Our experienced staff will provide support and advice along the way. With unparalleled customer service, superior products and fast shipping, Eagle Superabrasives is an easy choice for all your grinding needs. Contact us today to place an order or request a quote.